Everyone plays a specific role in the food chain of life. You might be a human thinking they are king of the hill or you might be a bacterium under the feet. You are very important to the survival of the system no matter what role you play. As you study more about ecosystems and cycles in life, you will see the terms food chains and food webs. They describe the same series of events that happen when one organism consumes another to survive. Food web is a more accurate term since every organism is involved with several other organisms. Cows might be food for humans, bacteria, or flies. Each of those flies might be connected to frogs, microbes, or spiders. There are dozens of connections for every organism. When you draw all of those connecting lines, you get a web-like shape. Producers are the beginning of a simple food chain. 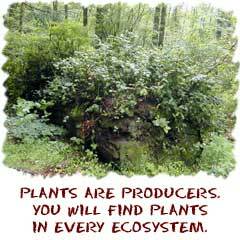 Producers are plants and vegetables. Plants are at the beginning of every food chain that involves the Sun. All energy comes from the Sun and plants are the ones who make food with that energy. They use the process of photosynthesis. Plants also make loads of other nutrients for other organisms to eat. There are also photosynthetic protists that start food chains. You might find them floating on the surface of the ocean acting as food for small unicellular animals. Consumers are the next link in a food chain. There are three levels of consumers. The levels start with the organisms that eat plants. Scientists named this first group of organisms the primary consumers. They are also called herbivores. They are the plant eaters of the chain. It might be a squirrel or it might be an elk. It will be out there eating plants and fruits. It will not eat animals. Secondary consumers eat the primary consumers. A mouse might be a primary consumer and a cat might be the secondary. Secondary consumers are also called carnivores. Carnivore means "meat eater." In some ecosystems, there is a third level of consumer called the tertiary consumer (that means third level). These are consumers that eat the secondary and primary consumers. A tertiary consumer could be a wolf that eats the cat and the mouse. There are also consumers called omnivores. 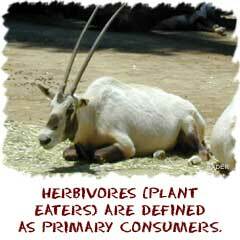 Omnivores can either be secondary or tertiary consumers. Humans and bears are considered omnivores: we eat meat, plants, and just about anything. The last links in the chain are the decomposers. If you die, they eat you. If you poop, they eat that. If you lose a leaf, they eat it. Whenever something that was alive dies, the decomposers get it. 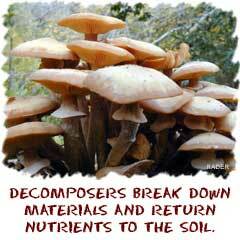 Decomposers break down nutrients in the dead "stuff" and return it to the soil. The producers can then use the nutrients and elements once it's in the soil. The decomposers complete the system, returning essential molecules to the producers.